Add the flour, sugar and salt. Pulse until it is well incorporated. Cut the cold butter into small squares and add to the food processor. Pulse until it creates a sand like consistency. Add the egg yolk and pulse to combine. Then, add the water 1 tablespoon at a time, while the food processor is running, until the dough comes together. Turn out onto a lightly floured board, pat into a disc, wrap and refrigerate for at least 2 hours. Slice the apples into 1/8-1/4” slices (do not peel the apples). Toss in a large bowl with cornstarch and brown sugar. Remove pastry dough from refrigerator. Cut into 6 small triangles (or you can leave as is if you are making one large galette). On a lightly floured surface, roll each into a small ball, and then with a rolling pin, roll into a flat, ¼” thick circle. It is ok if this is very rough in shape and the edges are jagged. This will add to the rustic look of the tart. Spread each circle with 2 Tablespoons Cinnamon Apple Jelly leaving the outer inch empty. Place the apple slices evenly across the jam. Fold the tart dough over the outer edge of the apples and pinch together as needed. Repeat with other tarts and place on the prepared baking sheet. Place back in the refrigerator for 30 minutes. Meanwhile, in a small bowl mix together the sugar and cinnamon. Remove from refrigerator and brush the edges with cream. 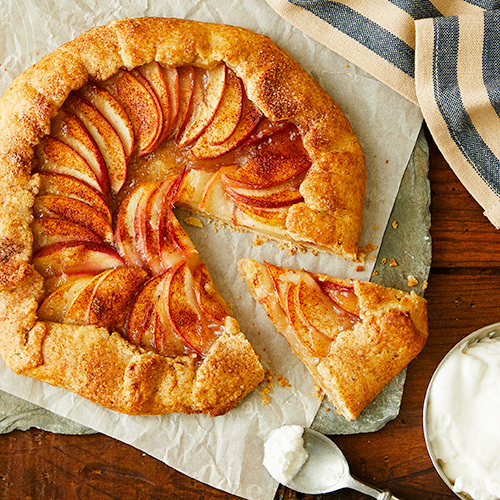 Sprinkle with cinnamon sugar and bake for 30-35 minutes, or until crusts have browned and the interior is bubbling. Serve warm with ice cream or whipped cream.